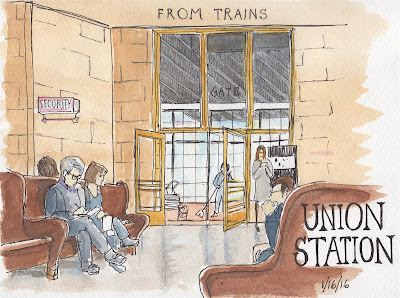 Last Saturday's sketchcrawl began a little drizzly, but I didn't want to miss a chance to sketch the outside of Union Station. I drove around in a perplexing circle of one way streets, until I found a perfect parking space. This view was periodically blocked by buses, but over two and a half hours, all of it was revealed in bits. I was delighted to be able to see Union Station's towers, the Fremont and Broadway bridges and two construction cranes all from my lucky spot. By the time my drawing was done, it was pouring rain and my windows were all fogged up. I finished up with watercolors at home. 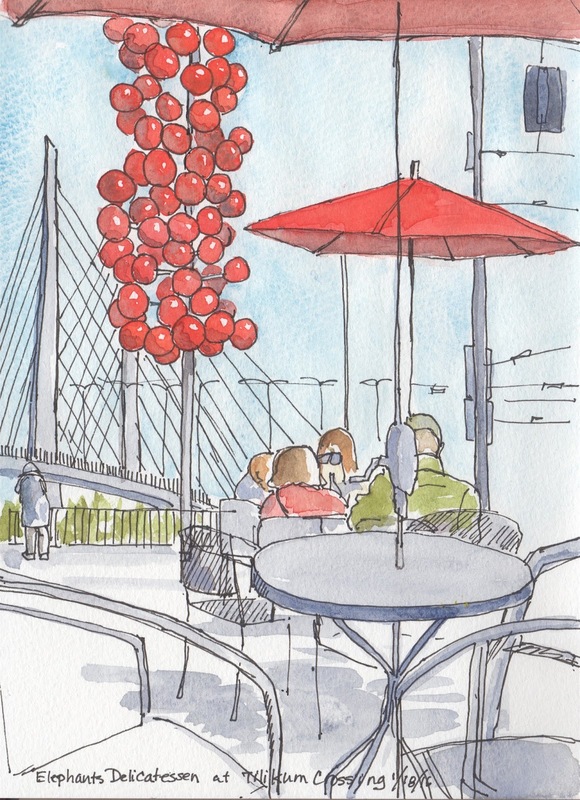 It may look like I'm getting the jump on next month's Tilikum Crossing sketch crawl, but actually, I was just out enjoying our somewhat sunny day on Monday. It was my first time walking over our newest bridge. 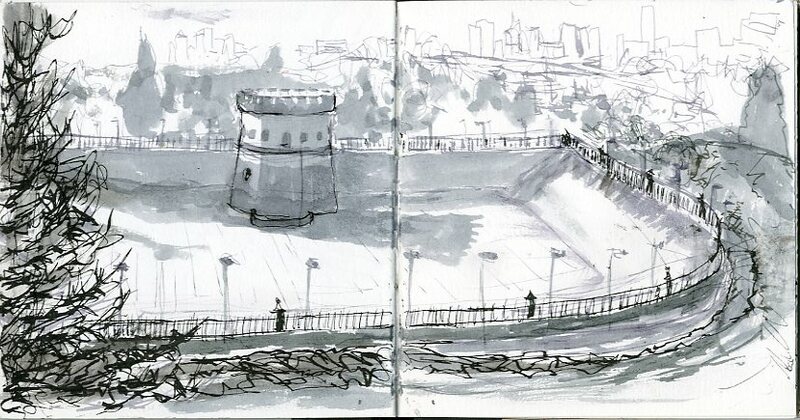 Afterwards, we got coffee at Elephants on the west side and I sketched the view from there. I'm eager to come back next month because the sketching possibilities look great. 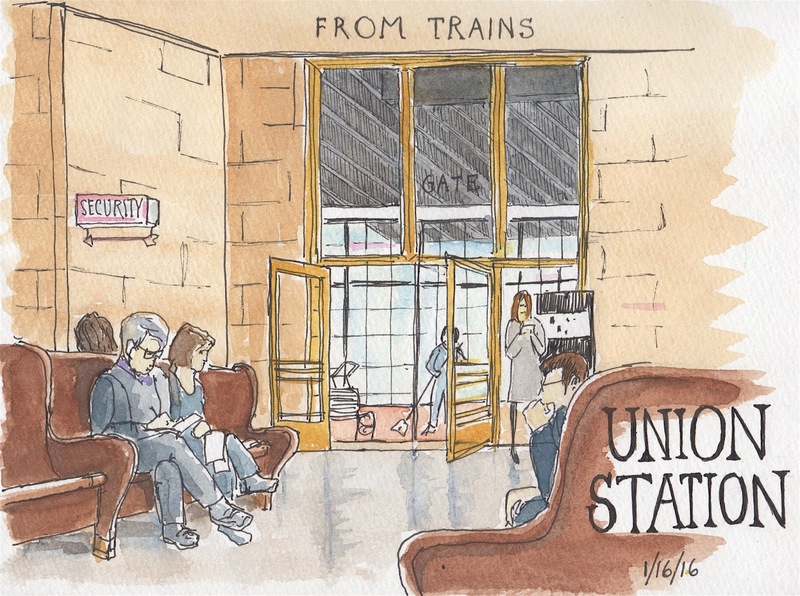 Here's my sketch from last Saturday's sketch crawl at Union Station. If you were one of the two dozen or so people who came out for this, you might realize that this sketch was black and white when we shared sketchbooks. I added the watercolor at home. If you're one of the sketchers shown here, please excuse me for taking liberties with your appearance as they were unintentional. It was a fun sketch crawl and it was great to have so many people join in the sketching and then the lunch and sketchbook sharing. This last sketch was made at f&b, the cafe inside Rejuvenation Hardware. I took liberties with these people, too, adding a beard on the barista and combining parts of other people for the customer. Those were intentional coverups to fix mistakes made trying to draw quickly moving people. 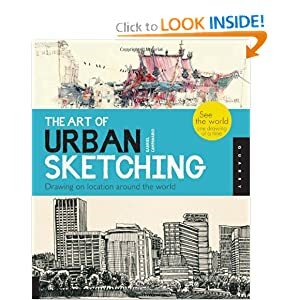 Frances Buckmaster, USk-Tacoma Admin, and her team of co-admins, are putting together a fun-filled weekend of sketching in this fourth summer of sketching fabulous American West Coast cities. 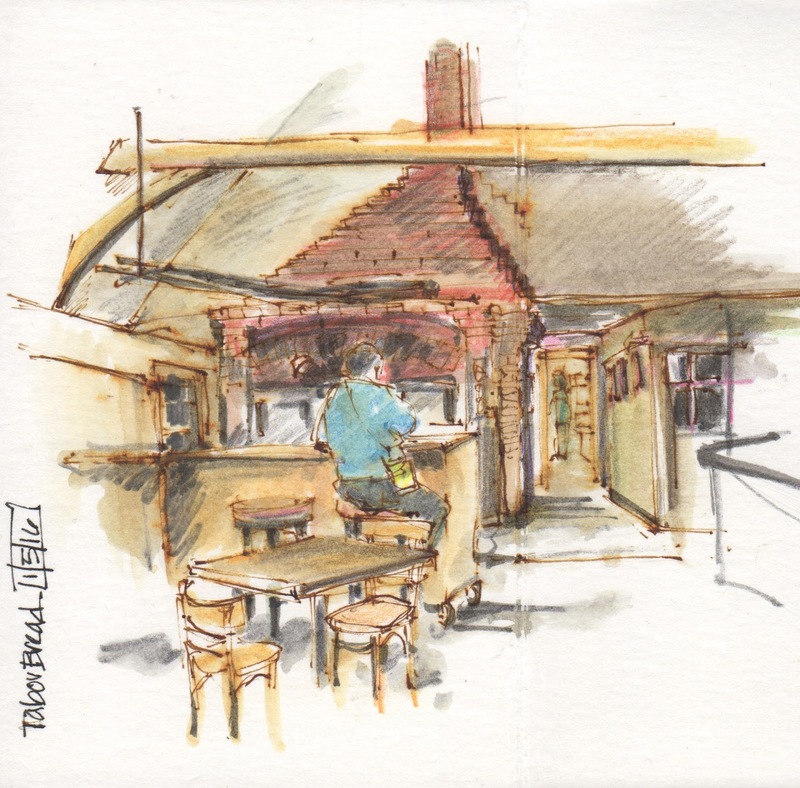 The Fourth Annual West Coast Urban Sketchers Sketch Crawl, will be held in Tacoma, Washington (USA) Aug. 19-21, 2016. Tacoma offers an historically and architecturally rich downtown area. San Francisco, Portland and San Diego were hosts of this annual event in previous years. See the blog for details. regarding past events, the agenda (schedule of events for Tacoma), lodging information, how to RSVP if you plan to attend, and our Facebook link. This is a free event. This is my first attempt at a post. I hope it works. Can you believe how beautiful it was out there last weekend? I felt I had to seize the day! 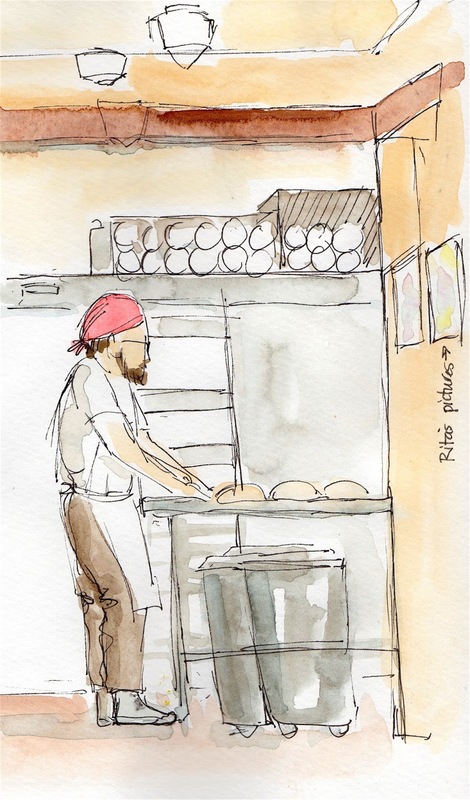 After Portland's icy freeze, it felt good to get out of the house to join Deb at the warm, cozy and yeasty scented Tabor Bread on upper Hawthorne. 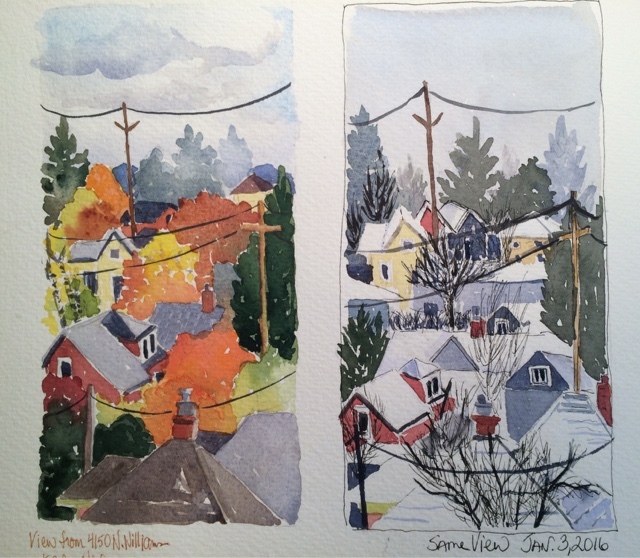 Our primary intention was to see Rita's watercolors of Portland Landmarks that are on showing there until mid-January. I knew I wanted some of Rita's art to display at home and I'm pleased with what I bought. Now, I hope it will work its inspirational magic on me, too. I was on a tight schedule, so I got in a couple of quick sketches and added the color at home. 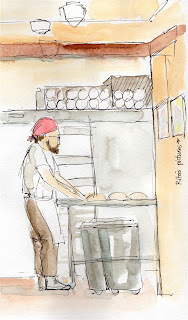 The baker was constantly on the move, making loaf after loaf in the back of the shop. He was too quick for me to try to measure, so he came out differently proportioned than in reality. Next, I tried to get a little group at the children' table. 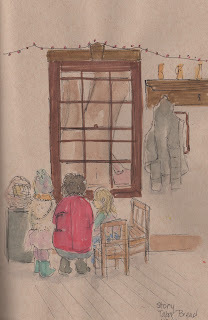 A woman was reading to two little girls, one in fur vest, boots, and gathered skirt and the other in a ballet tutu. I love how they dressed with such pizazz, even in the cold, wet weather. Ordinarily, I probably wouldn't post rough, crookedy sketches like these, but Deb and were talking about how we'd like it if people posted here more often, so here's my contribution. I hope to sketch with lots of you in 2016 and I hope lots of you will post your creations here, too. Oh, and try to get to Tabor Bread while Rita's show is up to see her work and to have some delicious treats, and maybe make a sketch. You won't regret it! 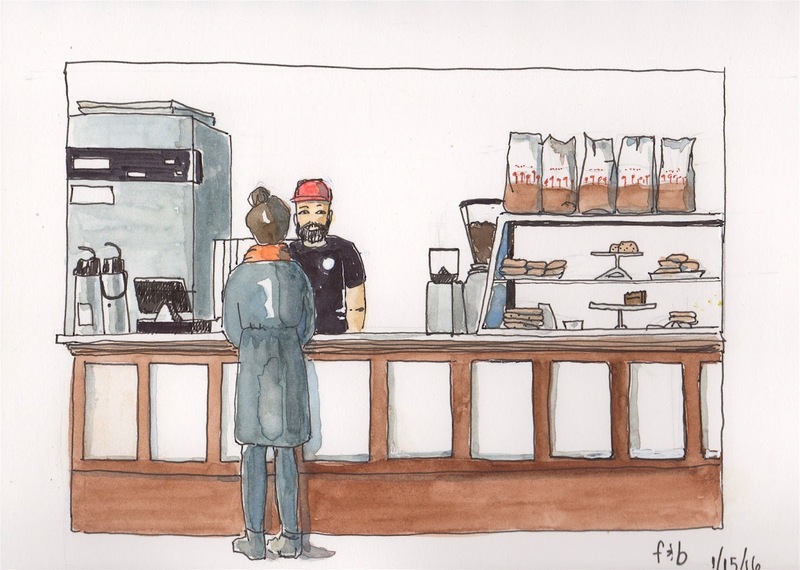 Finally made it to Tabor Bread to see Rita's Portland Sketches. It was hard to decide on which one to purchase, The Envoy with the lovely autumn trees was my favorite to start but then I saw the full scene of the Port of Portland taken from the Bluffs and it was decided. That was the one! After we made our Rita sketch selection Vicky and I enjoyed a beverage and sat down to do our own sketch. This is my first sketch of 2016...hoping this will be a very good sketching year for me and for all of my usk sketching friends!! I decided to sketch the same view from our living room that I did in the fall. I had to sketch quickly as I was losing the weak afternoon light. I have decided I will use the same format to capture spring and summer. Looking at the grey landscape that seems a long way off! Happy New Year Portland sketchers! 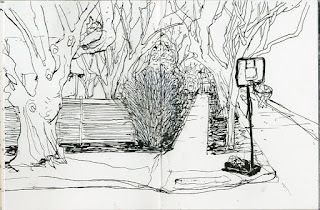 Let's meet at the train station for the sketch crawl on Saturday, Jan. 16. 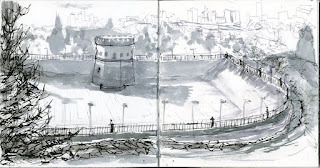 It has options for indoor and outdoor sketching in case of bad weather. 10:00am - Meet at Union Station, 800 NW 6th Ave, in the waiting area, for introductions. There is a shop in the station where you can get coffee and snacks. 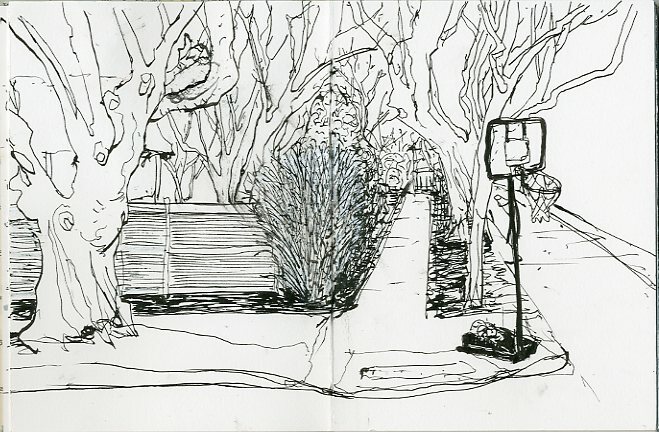 10:30am - Sketch in or around the train station. 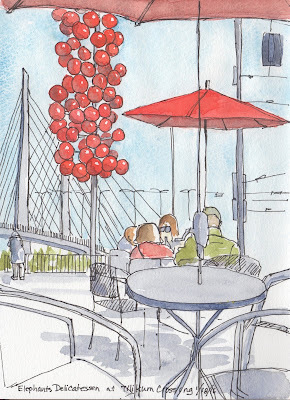 12:00noon - OPTIONAL sketchbook sharing and lunch at Old Town Pizza, 226 NW Davis. Let's go to Tillicum Crossing in February. 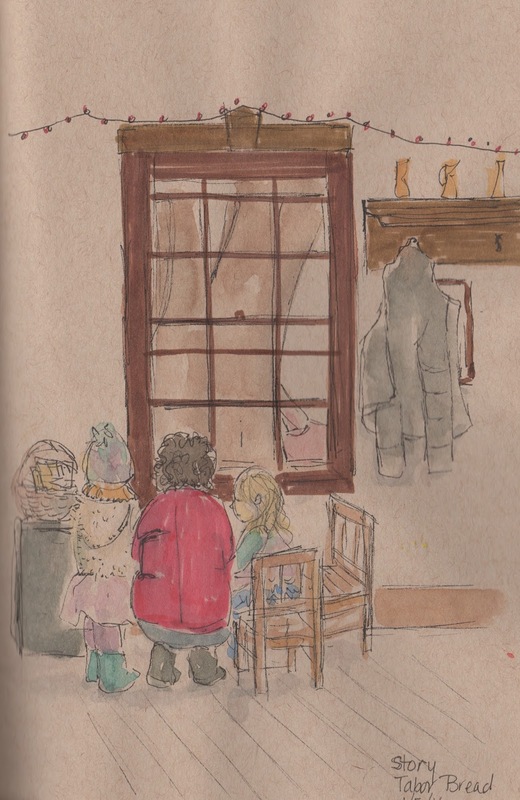 It may be raining but we can always sketch from inside Lovejoy Bakery.